Monday February 1st 1909 Weather much milder. I was busy with the work all forenoon and went down to Woolfs in the afternoon to visit with Mary. Jennie and the children started to [Deloran?] this morning. I worked at my tatting in the evening. Will had Mr Hoffman help him do some work today. 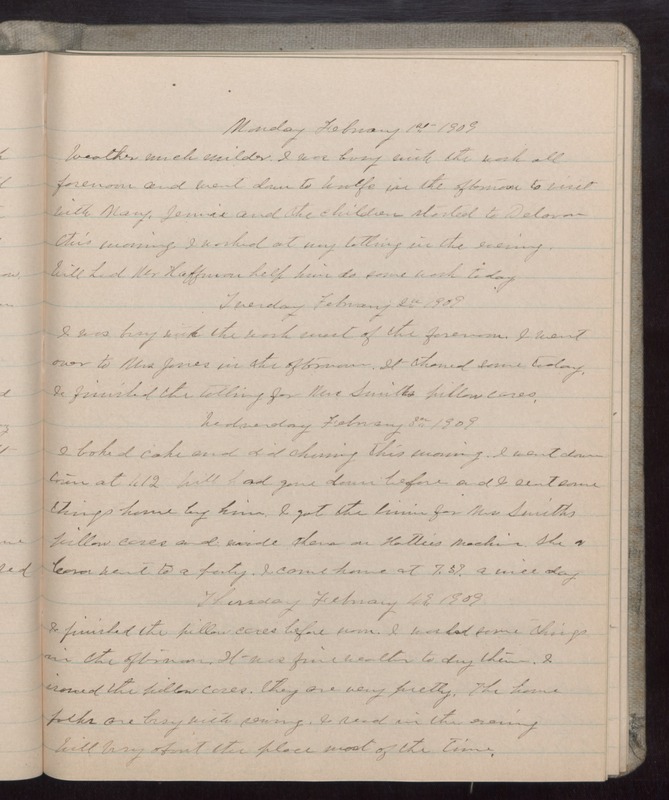 Tuesday February 2 1909 I was busy with the work most of the forenoon. I went over to Mrs Jones in the afternoon. It thawed some today. I finished the tatting for Mrs Smiths pillow cases. Wednesday February 3 1909 I baked cake and did churning this morning. I went down town at 1.12 Will had gone down before and I sent some things home by him. I got the linin for Mrs Smiths pillow cases and made them on Hatties machine. She & Cora went to a party. I came home at 7.39. a nice day. Thursday February 4 1909 I finished the pillow cases before noon. I washed some things in the afternoon. It was fine weather to dry them. I ironed the pillow cases. they are very pretty. The home folks are busy with sewing. I read in the evening Will busy about the place most of the time.